Synopsis: Kali’s kingdom is imprisoned—and she may hold the key. In one breathless moment, royal scout Kali’s world has turned on its head. Bishop Bahir has deposed the king and seized the palace—with Kali’s sister trapped inside. Now on the run, Kali, Trace, and the future king of Dansil have only one place to go for help: Everett. An enemy kingdom of which Trace is the presumed-dead heir. As Trace reclaims his identity—one that may leave no room for a Dansil spy—Kali faces her own growing magic, which may be their only hope of stopping Bahir. With shattering secrets, daunting new powers, and uncertain allegiances, Kali must walk a deadly tightrope to protect her kingdom—and her heart. 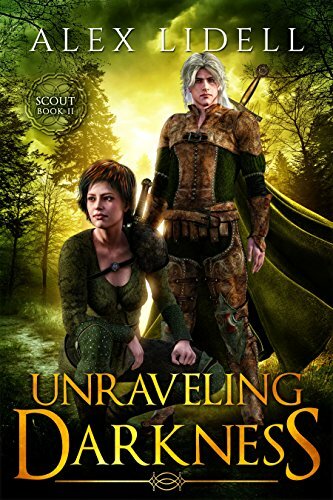 UNRAVELING DARKNESS, by Amazon bestselling author Alex Lidell, is the final novel in the Scout series. Perfect for fans of Tamora Pierce, Leigh Bardugo, and Sarah J. Maas. My Review: Kali, Trace, and the uncrowned king of Dansil is on the run. Bishop Bahir has seized the throne, and Kali’s sister is still imprisoned inside the palace. The only place for Kali and her gang to go is to Everett, their enemy kingdom. Once they arrive, Trace fights to keep his rightful inheritance, and Kali learns the truth about who she is. Can Kali save the kingdom of Dansil before it is too late? Because I was so engaged in Kali’s character, I read this sequel in one sitting to find out what happened to her. Kali still has her spunkiness, but she has grown more mature. She is left with the impossible choice of leaving her sister behind. She has to make plans to restore her kingdom. This takes a burden on her. I was a bit disappointed that she was no longer a fighting warrior. Instead, she realizes that she has magical powers, and has to learn how to use them. Thus, Kali has become more mellow and grown up. I also thought that Kali’s relationship with Trace had deepened. They faced many obstacles and challenges, but they managed to overcome them. Overall, Unraveling Darkness is a coming of age novel about self-discovery. The novel emphasizes friendship, family, and sacrifice. I still thought that the supporting characters were not well-developed. For instance, I did not understand why Princess Raza hates Kali. The explanation seemed flimsy. The story seemed rushed in most parts. Trace’s background is barely explored with depth. There were also some scenes that I found uncomfortable. Despite these flaws, it was still an enjoyable and worthy sequel! Mrs. Liddell is a talented author, and I look forward to reading more of her series! This series is perfect for fans of Tamora Pierce, Rachel Hartman, and Sara B. Larson.